Catherine V. (Giovanella) Cipriano of Newton Centre passed away on Feb 2, 2019. She was 96. Catherine was born in Wellesley and was a graduate of Wellesley High. 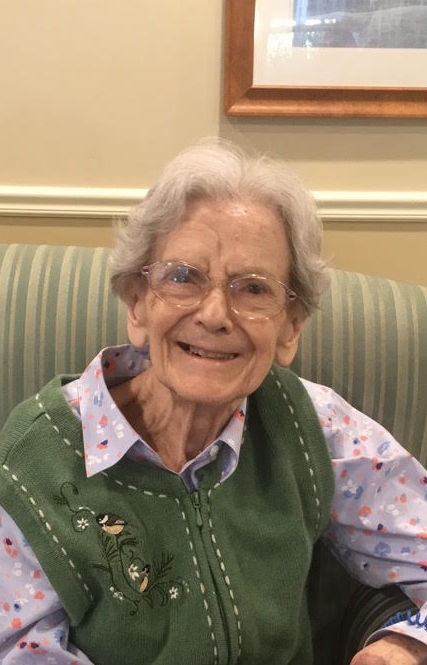 She had been a resident of Newton since 1945 and was a member of the Guild of St. Francis at Sacred Heart Parish and a member of the parish bowling league. She enjoyed gardening and feeding the birds in her yard. She was the beloved wife of the late James “Jake” Cipriano, the loving mother of Linda and her husband Cabot Devoll of Canton, Janet and her husband Ed Harrington and Michael Cipriano and his wife Patricia all of Newton. Dear “Nana” of Julie, Michael, Mark, Kristen and Monica and great grandmother of Abigail, Patrick, James and Sawyer. She was pre deceased by 5 brothers and 4 sisters and is survived by many nieces and nephews. Relatives and friends are invited to gather for visitation in the Eaton & Mackay Funeral Home 465 Centre St Newton Corner on Thurs Feb 7 from 8:30 until 10 AM followed by her Mass of Christian Burial in Sacred Heart Church, Newton Centre at 10:30 AM. Interment will follow in St. Mary’s Cemetery.